How to set the NFB-12 DAC output as variable line level only? The NFB-12 has one group Line out for dedicated DAC output, In default its output level setting is at variable model . But owners can set it to can select between variable and fixed or output variable line level only . 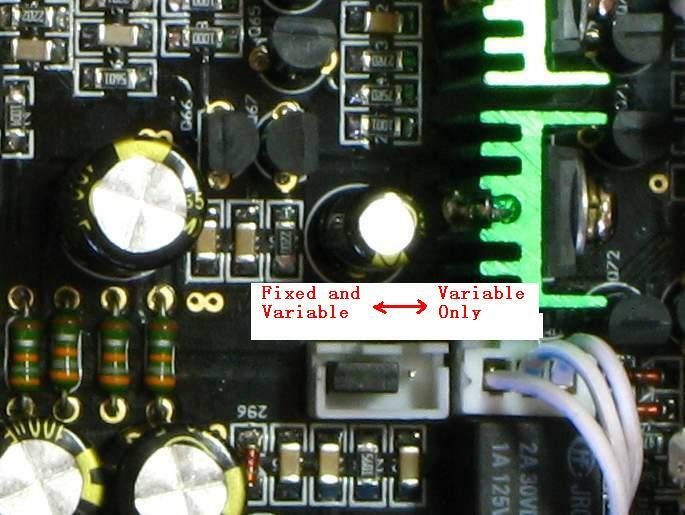 See the photos, change the jumper to "variable" side to set the DAC output to variable only. Output switch: Select output between headphone, Fixed DAC output and Variable DAC output. Gain switch: Select gain between low gain (+0DB) and high gain (+12DB). Volume knob: Control the volume level of the headphone and variable DAC output. Selector switch: Select source between USB, coaxial and optical. Power socket: For power input and power ON/OFF switch. USB socket: For USB input. Opt socket: For optical input. Coax socket: For coaxial input. DAC out sockets: For dedicated DAC output. (The DAC output level can be chosen between variable and fixed, see below). 9 types digital filter users setting. For NFB-12 only, NFB-12.1 setting on the front plate. In 4X oversampling setting ,while select SPDIF input but without input signal, maybe output some noise. If the input sampling higher than the NFB-12(12.1) setting sampling, maybe cause some noise output. 8X oversampling , Minimum phase apodising filter. 8X oversampling , Linear phase apodising filter. 8X oversampling , Linear phase half-band filter for backward compatibility. 4X oversampling , Minimum phase 'soft-knee' filter. 4X oversampling , Linear phase 'soft-knee' filter. 4X oversampling , Linear phase 'brickwall' filter. 2X oversampling , Minimum phase 'soft-knee' filter. 2X oversampling , Linear phase 'soft-knee' filter. 2X oversampling , Linear phase 'brickwall' filter.